The main Cham dancers portray Dharmapalas or Wrathful Deities. The dharmapalas are ‘protectors of the law’ and in Tibetan are called chos kyong. Many of the Wrathful Deities were brought from India when Buddhism came to Tibet. Others were originally Bon deities or mountain gods / local spirits who were put under oath by Padmasambhava or others to protect the Buddhist dharma. He is the main character in a majority of cham dances. His story is the strong stuff of good folklore. “Originally he was a monk who believed that if he went into seclusion and deep meditation for fifty years he would attain enlightenment. He was in the final hour of the final day of his 50-year long meditation when two rustlers came into his cave late at night with a stolen bull. Thinking they were alone, they proceeded to cut off the bull’s head. When they realized that the hermit monk has seen them, they threatened to kill him too. The monk begged for mercy, explaining that all his efforts over almost fifty years to attain enlightenment, which would happen in a few short minutes, would be lost if they took his life. Unmoved, the rustlers cut off the monk’s head as well. Yama was of course very angry that he had been denied his enlightenment, although some say that, in spite of this, he quite enjoyed his new look. He was also very pleased and satisfied with killing the two robbers, drinking their blood and eating their vital organs. In fact, he liked it! And so he continued killing people and was soon on a murderous rampage throughout Tibet. The people were very afraid and asked for assistance. Eventually Yama was soundly defeated and turned into a protector deity, a sworn defender of the faith. He has since become one of the main and most important Cham dancers. Sometimes known as the God of War, Begtse is dressed very much in warrior’s garb. Unlike most wrathful protectors, Begtse does not wear a diadem or crown of five skulls. Instead he wears a red helmet, typical of the Mongolian warriors of his time, from which protrudes a ‘banner of victory’. He has a red demon face and four fierce fangs; his limbs are thick and short. He carries a lance laden with banners in his right hand and a bow and arrow in his left. He is rumoured to live in a leather castle on top of a mountain of copper surrounded by a sea of blood. Begtse is one of the youngest dharmapalas, having only joined the ranks of Tibetan Buddhism in the 16th century. Originally Begtse was a pre-Buddhist deity of the Mongols and he had tried to block the passage of Sonam Gyatso, head of the Gelug order, on his pilgrimage to Mongolia to meet Altan Khan in the late 16th century. Sonam Gyatso, transforming himself into the Bodhisattva Avalokiteshvara, defeated Begtse’s attempt to stop the visiting monk. Begtse realized that he had witnessed the great power of Buddhism and gladly became a protector of the Buddhist creed. The Gelug lama continued on his journey and met with Altan Khan. It was during this visit that Sonam Gyatso’s name was translated in to the Mongolian ‘Dalai Lama’ by the Mongolian khan. Two previous patriarchs were posthumously given the same title, so Sonam Gyatso became the Third Dalai Lama. Sonam Gyatso, the Buddhist visitor from Tibet, was a lama in Mongolian eyes. They thought that ‘Gyatso’ was a family name which in Tibetan means ‘ocean’. Translated into Mongolian it becomes ‘dalai’. So the Gyatso lama was called the Dalai lama - hence the term Dalai Lama. Namse is the God of Wealth, and his main task is to guard and dispense wealth and treasures. In his emanation as Vaishravana, he is a lokapala , the Guardian King of the North, and the leader of the group of four Guardian Kings. Namse is easily recognizable by his yellow ‘like pure gold’ color, and he wears a diadem not of skulls but of jewels. In his right hand he holds ‘the banner of victory’ while in his left he cradles a jewel-spitting mongoose. He wears a guardian-warrior's armour underneath several layers of fine colourful silk. While not ‘wrathful’ in the same visual sense as Yama or Mahakala or the flesh-eating Palden Lhamo, Namse is a protector as well as a benefactor. He dances frequently in Amdo region chams. Name given to members of the group of four Guardian Protectors of the Four Directions. They defend the four cardinal point entrances to the mandala.Vaishravana defends the North, Dhritarashtra defends the East, Virudhaka defends the South, and Virupaksha defends the West. Central to the Cham dance, and the most important of all the wrathful deities, is the dharmapala known as Gon po, meaning Master, Lord, or Protector. He is also known as Gonpo nagpo or the Great Black One. Gonpo can also be interpreted as ‘enlightened righteous wrath’. 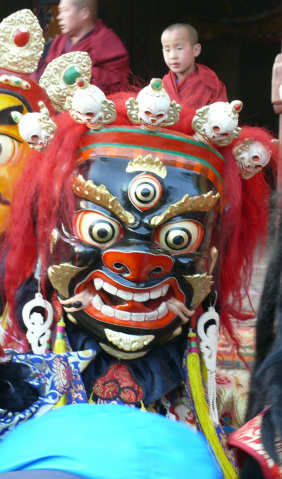 More commonly recognized by his Sanskrit name Mahakala, he figures prominently throughout the pantheon of Tibetan Buddhism’s fierce protectors. While he originated in India, he was quickly absorbed into the lexicon and practice of Buddhism in Tibet and melded well with some of the myth and mystery associated with the pre-cursor Bon religion. Mahakala is the fierce manifestation of Avalokiteshvara, the Bodhisattva of Compassion, and sometimes also the manifestation of Chakrasamvara. He is by far and away the most popular and well known of all the Protector Deities, as witnessed by his manifold emanations. His story is the essence of wisdom and compassion, and is another great read. Mahakala quickly became a favoured wrathful protector. He has been adopted by all major orders of Tibetan Buddhism, and is certainly loved by the people. There are many different emanations or variations of Mahakala, which attest to his popularity and longevity. Most scholars agree that there are at least 72 different Mahakalas. Dramze is the most powerful of all the Gonpo manifestations. He is rarely seen and does not participate in Cham dances. He characteristically holds a human thighbone in his right hand or has it laced in his hair at the back of his head. Sometimes the thighbone is in the form of a trumpet. He has a beard and sometimes four faces. His tangkas and statues are normally covered and are revealed only when very senior lamas are visiting. The Gonpo Dramze shown in the photo to the left is a statue in Sakya Monastery, Tibet. It is normally covered but the author was allowed to photograph it for this monograph. Palden Lhamo is the only female deity in the group of Dharmapalas. As such she has a very important position and is much loved by the Tibetan people. In Sanskrit she is called Shri Devi meaning Lady Goddess or Great Lady. The most common story about Palden Lhamo concerns her marriage to Shinje, the King of Lanka. “The King of Lanka was a very nasty character and had a penchant for executions, murder, and widespread slaughter of many of his subjects. The king also wanted to expel Buddhism from his kingdom, probably since he felt it would constrain his bloodlust activities. Palden Lhamo, his wife, vowed to convert him into a supporter of Buddhism and make him a gentler and kinder king - or to put an end to his dynasty. They had a son, and as the boy grew up, Palden Lhamo continued in her efforts to change the ways of her bloodthirsty husband, with added urgency since the king was instilling his bloodlust values into their son. Indeed, the young prince looked willing and indeed eager to continue the work of his father. Palden Lhamo finally acknowledged her failure and vowed to stop their son from continuing the murderous ways of his father and expelling Buddhism from the kingdom. Shortly thereafter, while the King was away on a hunting trip, Palden Lhamo killed her son. She skinned him, drank his blood, and ate some of his flesh and organs. The skin was used as a saddle blanket on her steed as she fled the palace for her home north of Lanka in Tibet. Palden Lhamo is the Chief Protector of the Gelug (Yellow Hat) order. She is also a protector of the Sakya order, and the Dalai Lamas. As the emanation Ma Mo she is the Protector of the City of Lhasa. In another emanation, she is the consort or yum of Six-armed Mahakala (gonpo chakdrugpa) previously introduced. Magzor Gyalmo is an emanation of Palden Lhamo. While Palden Lhamo has four arms, Magzor Gyalmo is shown in tanka paintings and literature as having only two arms. And while Palden Lhamo is always shown iconographically with a sun and moon disc at her waist, Magzor Gyalmo has the disc above her head or in her hair. Magzor Gyalmo is very popular in Amdo region while Palden Lhamo is virtually unknown to the common folk in the countryside. Hayagriva (Tibetan: tam drin) is a meditational deity easily recognizable by his reddish-brown color face and the green horse head atop his hair (he may have up to three horse heads atop). His form can be simple to complex, with multiple faces and arms. Hayagriva is common to all Tibetan Buddhism orders. Hayagriva was a popular figure in the Cham dances of the last century, but events and circumstance have reduced the frequency of his appearance in any dances. The author was fortunate to witness a Hayagriva Cham at Kumbum Monastery, which features Hayagriva as the main dancer. As shown in Figure 5-18, the dancer is wearing a wooden mask that is reputed to be almost one hundred years old and to weigh almost 25 pounds (12 kg). Yamantaka (jam yang), as the name might suggest, is closely associated with Yama, the Lord of Death. The story of Yamantaka is also of note. The depiction of Yamantaka in the photo to the right was taken from a tangka in a Nyingma monastery. Since Yamantaka is not a normal Cham dancer, he does not have any reliable mask or costume as his representation. The Dharmapalas, and their emanations and / or acolytes, are the main dancers encountered in most chams. While some chams will give Yama the major role, others will rely on Ksetrapala from Mahakala’s entourage to take center stage for a while. Begtse also figures prominently in many chams, and the popular Palden Lhamo and her assistants Chisun and Songdong can usually also be counted on to make an appearance. But sometimes, depending on the monastery, its lineage, and other local customs, the main part of the dance will be performed by the Black Hats or Shanags. The Shanags are the famous Black Hat dancers. They are imposing, look impressive, and harken back to the days of sorcery and black magic in the world of Bon. Arrival of Shanags, Gomar Monastery. The Black Hats, also known as The Magicians, have a special place in the history of Tibetan Buddhism, being as some suggest indirectly responsible for the survival of the religion in Tibet. Here is another popular story. “Lang Darma ruled Tibet from 836 - 842 CE, having ascended to the throne by killing his older brother. A strong supporter of the Bon religion, Lang Darma was determined to banish Buddhism from Tibet. He ordered monks to de-frock, scriptures were burned and monasteries and nunneries were closed. One monk decided that this was not right and determined to stop King Lang Darma. Monk Pelgyi Dorje dressed in a Bon magician’s black hat and black cloak and found the King in front of the Jokhang Temple in Lhasa. The monk started to dance with such prowess and agility that the King’s assistants begged him to come and watch more closely. When the King was close enough, Pelgyi Dorje removed a bow and arrow from the big sleeves of his cloak and shot the King with an arrow through the heart. As the King died, confusion ensued and the monk-assassin made his escape. The Bon magicians black hat and costume (zhva nag) gave rise to the name Shanag and its importance is enshrined in the Cham dance. The Shanags have several functions in the dance, depending on the nature and location of the event. In most dances, two Shanags announce the arrival of important dancers and are personal attendants to the Thunderbolt Dance Master, Dorje Lopon, who is in charge of all aspects of the dance. In other aspects of some Cham dances, two Shanags are responsible for the implements that are given to Yama as he performs the ultimate activity of the Cham dance. In other dances, a larger group of Shanags dance a major portion of the Cham. At Gonlung Jampaling there is a spectacular and large Shanag cham dance during Monlam. Another very special dance, the Gu Cham, was held at the Vajra College, Labrang Monastery, in the ninth lunar month of 2009.